We are fresh off of a stay at one of Disney’s deluxe resorts, Disney’s Beach Club and absolutely loved it! There are many things to love about this resort, but here is our list of the top seven things that you’ll love about the resort! 7 – It’s So Close to Epcot and Hollywood Studios – the Beach Club (along with 4 other resorts) is situated around Crescent Lake. This waterway acts as the connector between Epcot and Hollywood Studios and allows guests to quickly navigate to either park. The Beach Club is the first resort guests will encounter leaving from the International Gateway in Epcot. The walk to Hollywood Studios is a little bit longer, but is a very enjoyable and nice walk along the water. The walk is a little faster than hopping on one of the Friendship Boats, but they are also very convenient if your feet are too tired! 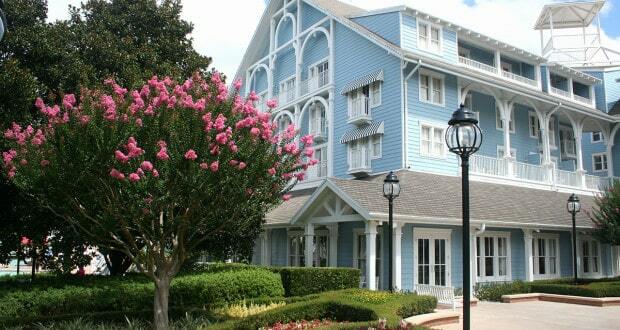 6 – You Get Two Resorts – the Beach Club and the Yacht Club are connected and guests are able to walk to the Yacht Club with only having to walk outside very briefly. The Yacht Club is home to some great dining options. This can be very convenient when you are planning ADRs for your trips and are looking for something near your room. 5 – The Lobby Smells Amazing – we were guests at the Beach Club during the changeover from Christmas and back to normal decorating, so it could be a mixture of the gingerbread that was pumped into the lobby and the normal smells of the Beach Club, but the lobby smells great. It is a welcome smell when returning from a long day in the parks and left me feeling invigorated and refreshed! 4 – Lounges Galore – one of the things that I am coming to appreciate more and want to explore more are the lounges and bars at the various resorts. Between the Beach Club and Yacht Club, guests have many choices at their disposal. At Beach Club, guests can enjoy a drink at the Martha’s Vineyard Lounge or at the poolside bar, Hurricane Hannah’s or they walk over to the Yacht Club and enjoy a drink at Crew’s Cup Lounge (they also have an amazing bar bites menu) or go to the Ale and Compass Lounge. 3 – Stormalong Bay Swimming Pool – one of the best features for guests staying at the Beach Club is the pool. The pool is a meandering pool that features a waterslide and a lazy river, but also is sandbottomed, adding to the theming that guests are staying at an authentic beach club. The pool is so popular that guests are required to display their MagicBand to ensure they are guests at either the Beach Club or Yacht Club – no pool hopping to experience this pool! 2 – Boardwalk Entertainment – within a short walk or Friendship Boat ride, guests can experience all of the entertainment and dining options at Disney’s Boardwalk. One of my favorite activities when we were staying there was to walk the Boardwalk early in the morning before sunrise and see Spaceship Earth in the distance. There is plenty to do at the Boardwalk between restaurants and entertainment – I just wish we had more time at the resort to take advantage of all that there is to offer! 1 – Beaches and Cream’s Kitchen Sink – being a self-described food fanatic and lover of desserts, Beaches and Cream is a fantastic find. Guests can be treated to soda shop fare – hot dogs, burgers, hot sandwiches, but you’ll definitely want to save room for the Kitchen Sink. Served in actual kitchen sink “bowl,” guests are treated to an amazing amount of ice cream and toppings. You’ll definitely want to have some assistance when trying to tackle this dessert! The Beach Club is in the middle of the action between resorts, restaurants, bars, and entertainment. You’ll definitely want to consider this resort for your next trip to Walt Disney World. Have you stayed there? What is your favorite thing about the resort?